The UK Premiere of Sikh Youth UK's latest film - Citizen Erased took place in Birmingham on Saturday 17th March 2018. Despite the bad weather, almost 200 people travelled from across the country to see the latest release. Manpreet Singh went along to the Premiere and answers some of our questions on the short docu-film and also on the important topic Citizen Erased covers below. 1) What did you think of the film? Did you enjoy it? I thought it was good and I'm glad I watched it. I felt that some of it were overdramatic, though, which made it difficult to take seriously. 2) What did you take away from it? The film highlighted a key issue about how parents can heavily influence the mindset of their children and how they will grow up. We should aim to be role models for everyone in our lives, especially the younger generations. We should inspire them by teaching them about other amazing people around the world, and those who lived in the past, such as our Guru Jis. We need to learn how to have conviction in doing what's right, but we must also learn to be accepting of others and support them through whatever they are going through. I think a common issue, especially in our community, is that when someone makes a mistake or goes down a "bad" path, we tend to renounce them and be ashamed of them because we fear what "other people will say", instead of doing whatever it takes to support and guide the people you care for. 3) What message did you think the film was trying to portray and did this come across? It irked me when the mum in the film expected her daughter to know about the "basics of Sikhi" even though she shut down all of the questions her daughter asked her as a child because "things were different" when the Guru Jis were here in the human form. How long will we allow others to control us? We've submitted to societal pressures and diluted Sikhi and righteousness to "fit in" with what's deemed to be acceptable. But if we do that, the whole world will soon reach a peak of self-destruction. We should be the ones to change that... I think this film showed me that we need to improve ourselves and sort out how we live our lives. 4) Were you aware of the issues discussed in Citizen Erased prior to seeing it? Yeah, I already knew about the majority of issues covered in the film thanks to organisations like Sikh Awareness Society, Sikh Helpline and Sikh Youth UK. 5) Is it a good film for college and university students to watch? I think it's really important for students to make themselves aware of issues like this because these years of our lives tend to be very influential in defining how we grow up. I think that students are often targeted because they are viewed as being mentally weak and easy targets for manipulation. If we want to protect ourselves, we need to first be aware of what issues in the world are. After that, we need to work on strengthening ourselves (and each other) spiritually, mentally and physically. If we raise our kids to have conviction in doing what's right, they're less likely to fall into Maya (worldly illusions). 6) what was the best part of the film? My favourite part of the film was the ending where the girl owned up to her mistakes and let out how her parents never supported her. Her acting was really good, and it highlighted the parents' mistakes in raising her, particularly in not teaching her about Sikhi. 7) What did you think of the premiere overall? I think it was a good film and the premiere was well organised. I think it should be shown again at Gurdwareh and universities to raise awareness. 8) What improvements of the film and or premiere would you suggest for future? My manager recently told me about some advice he received, which was "come to me with solutions, not just problems" meaning that it is indeed important to highlight problems, but it is very useful to suggest solutions to pick from, which can help us actually start solving the problem far faster and more effectively. I wish the film could have shown possible ways that we can prevent these issues from occurring in the first place, as I think prevention tends to be far more effective than working to heal damage after it's already occurred. It would be good to explain how Sikh Youth UK helps to remediate things like this when they happen. A trailer for the movie can be viewed here. Manpreet Singh graduated from the University of Birmingham in 2017. He was a part of the successful University of Birmingham Sikh society committee of 2016/17. 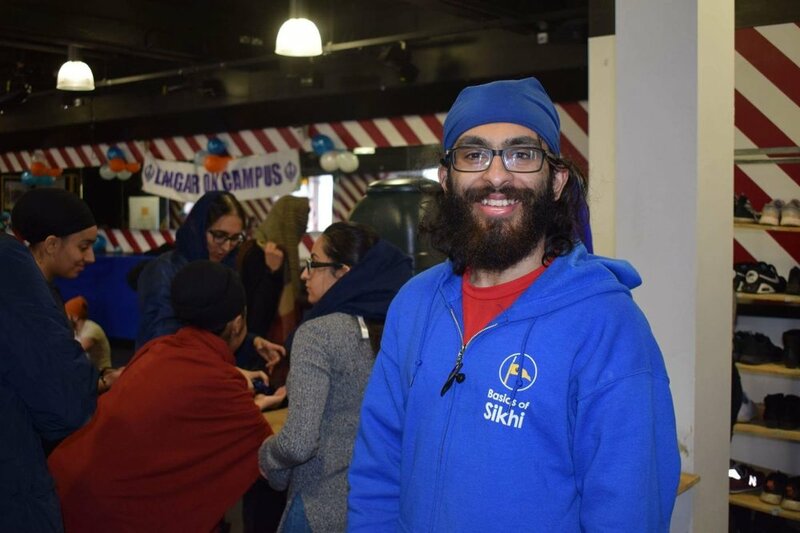 He now works in Cheltenham and takes time off from work to travel across the country and help serve at university Langar on Campus events across the UK.